Read this for information about converting existing virtualization hosts into hyperconverged hosts to create a hyperconverged cluster. Verify that your virtualization hosts use Red Hat Virtualization 4.2 or higher, and meet Red Hat Hyperconverged Infrastructure for Virtualization Support Requirements. Convert virtualization hosts to hyperconverged hosts. 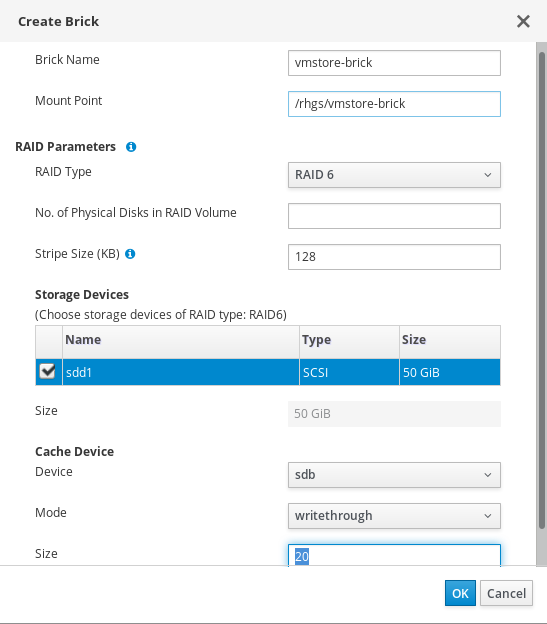 Create Red Hat Gluster Storage volumes using storage on the converted host. Hyperconverged virtualization hosts require access to the rhel-7-server-rhv-4-mgmt-agent-rpms repository. Red Hat Virtualization hosts are subscribed to this repository during installation and setup, so no further action is necessary. Red Hat Enterprise Linux hosts need to subscribe to the repository by running the following command. Follow this process to convert virtualization hosts to hyperconverged hosts. This lets you use and manage the host’s local storage as Red Hat Gluster Storage volumes. Log in to Red Hat Virtualization Manager. Move all hosts except the self-hosted engine node into maintenance mode. Select the host to move to maintenance. Enable the gluster service in the cluster. Click Compute → Clusters and select the cluster. The Edit Cluster window appears. Check the Enable Gluster service checkbox. Reinstall all hosts except the self-hosted engine node. Select the host to reinstall. Click Management → Reinstall and click OK. Wait for the reinstall to complete and for the hosts to become active again. Move the self-hosted engine node into maintenance mode. Select the self-hosted engine node. The hosted engine migrates to one of the other virtualization hosts. Reinstall the previous self-hosted engine node. Select the previous self-hosted engine node. Wait for the reinstall to complete and for the host to become active again. Your hosts are now able to use and manage storage as Red Hat Gluster Storage volumes. This task assumes you have raw unused storage devices attached to your virtualization hosts. Log in to the Administration Portal. 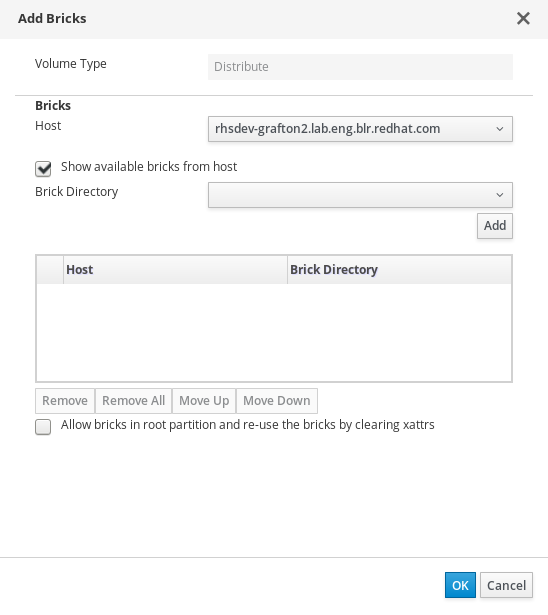 Configure your local storage as a Red Hat Gluster Storage brick. Click Compute → Hosts and click on the name of the host to use. Click the Storage Devices subtab and select the device. Click Create Brick to open the Create Brick window. Enter a Name for the brick. Verify or correct the suggested Mount Point. If the underlying storage uses RAID, enter the number of physical disks in the RAID device and confirm the RAID type. A new thin-provisioned logical volume is created on the specified storage device, with all settings appropriate for use with Red Hat Gluster Storage. Configure a Red Hat Gluster Storage volume. 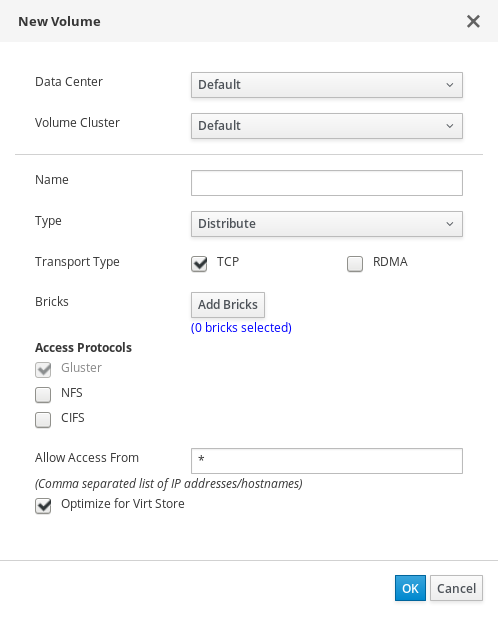 Select the cluster that contains your bricks. Enter a Name for the volume. Set the Type of volume to create. To use local storage without high availability, choose Distribute. See Setting Up Storage Volumes in the Red Hat Gluster Storage Administration Guide for more information about volume types. Click Add Bricks and select your existing storage as a brick for this volume. Optionally, for enhanced security, specify the IP addresses or hostnames of all hosts in the cluster in the Allow Access From field. Check the Optimize for virt store checkbox to configure the volume for storing virtual machine images. See the Red Hat Virtualization 4.2 Administration Guide or the Red Hat Gluster Storage 3.4 Administration Guide for more information about managing Red Hat Gluster Storage.